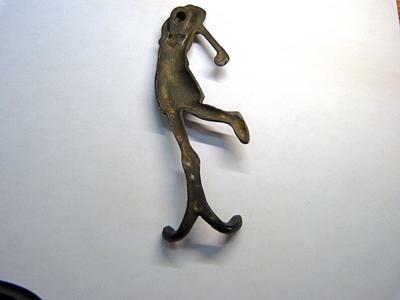 Antique Bronze Figure of a Golfer in Medieval Dress? I found this bronze figure of a golfer wearing clothes from the middle ages in a consignment shop. It is made of bronze, and is meant to be hung from a wall. It is big enough (6 inches) to hang small items from the hooks at the bottom. Some research indicates that golf, as we know it today, evolved from a medieval game played with curved sticks and balls. 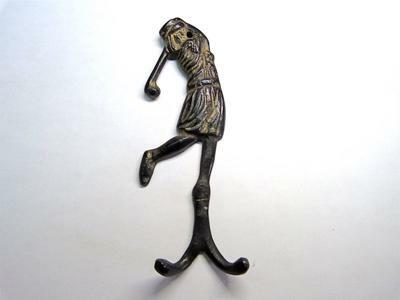 I have no idea if this item is an antique, but it is so unusual in its depiction of a golfer that I am keen to find out something more about it. Mary, it is doubtful whether a double coat hook would be considered antique. And, the images, although not detailed, appear to show a girl in a belted dress rather than someone medieval. The workmanship also appears a little too modern in its execution, for it to be classed as antique. The name golf may have been derived from the old Scots verb “to gowff” which means to “strike hard”. “fute-ball and golfe be utterly cryed down and not to be used”. The King was concerned that his citizens were far to involved in leisurely pursuits and that they were neglecting the Royal and vital sport of archery. It wasn’t until 1502, in the reign of King James IV and the Treaty of Perpetual Peace with England’s King Henry VII, before the Scots were allowed to spare time for golf. Mary Queen of Scots was also known to play a round or two. By the end of the 16th century people were neglecting church in order to indulge in this popular pastime. With the Union of the Crowns in 1603, King James VI and his court took golf to Blackheath in London, and the King had by then appointed an Edinburgh bowmaker as the Royal Gold Club maker.